Emmett has a wife and two children, a cat, and a duck, and he wants to know what life is about. Every day he gets up before dawn, makes a cup of coffee in the dark, lights a fire with one wooden match, and thinks. What Emmett thinks about is the subject of this wise and closely observed novel, which covers vast distances while moving no further than Emmett’s hearth and home. Nicholson Baker’s extraordinary ability to describe and celebrate life in all its rich ordinariness has never been so beautifully achieved. 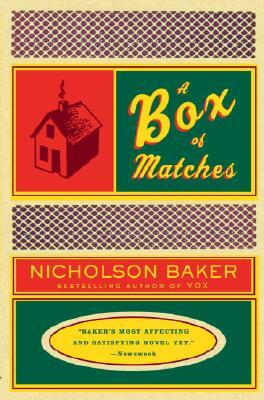 Nicholson Baker was born in 1957 and attended the Eastman School of Music and Haverford College. He has published five previous novels–The Mezzanine (1988), Room Temperature (1990), Vox (1992), The Fermata (1994), and The Everlasting Story of Nory (1998)–and three works of nonfiction, U and I (1991), The Size of Thoughts (1996), and Double Fold (2001), which won a National Book Critics Circle Award. In 1999 he founded the American Newspaper Repository, a collection of nineteenth- and twentieth-century newspapers. He lives in Maine with his wife and two children.